A tiny Virginia county sees itself in a 'David vs. Goliath' conflict after an anonymous complaint. PEARISBURG, Va. – Nearly 12 years ago, in the aftermath of the shootings at Columbine High School, officials quietly posted the Ten Commandments on the walls of the Giles County public schools. It was a natural reaction, said residents of this rural county peppered with churches, to such an alarming moral breakdown. There the commandments stayed, within nondescript frames that also featured the first page of the U.S. Constitution, stirring little controversy until December. That’s when an anonymous complaint prompted the superintendent to order the removal of the displays. The decision sparked such passionate community backlash that the county school board voted to post them again in January. Now the fight appears headed to the courts as residents of Giles County, along Virginia’s rugged, southwestern spine, fight what they call mounting pressure from Washington and Richmond to secularize their public institutions. The district also runs a so-called “Bible Bus” so that students can get privately organized Christian instruction off site during the middle of the school day. The commandments are featured on 8 1/2- by 11-inch pieces of paper in six schools, generally hung on white cinderblock near main entrances and hallways. School officials say the displays should be legal because the commandments are a historical document, included as part of a monument to the principles — some of them religious — on which the country was founded. The American Civil Liberties Union and the Wisconsin-based Freedom From Religion Foundation disagree. They plan to file a lawsuit on behalf of two plaintiffs, who have asked the court to withhold their names for fear of retribution. Both Virginia’s secretary of education and the superintendent of public instruction dismissed her concerns, said McNair, now 23, who moved from Manassas, Va., to Giles County. But when the issue flared again, in December, school officials consulted with legal counsel and decided to remove them. 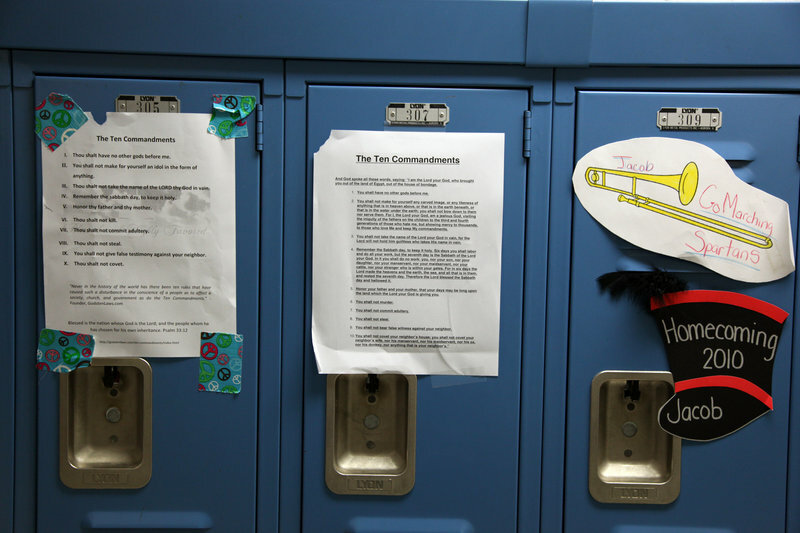 When students learned that the commandments had been removed, they distributed hundreds of photocopies of the edict, pasting them on lockers around the school. Weeks later, the halls were still papered with makeshift scrolls, next to photos of football players and fliers advertising sketch comedy routines. The turning point was a raucous school board meeting attended by more than 100 Giles County residents. Hanging the commandments is “a right” and “a blessing” and “a moral obligation,” residents said in the public forum. By the end of the meeting, the school board had voted unanimously to restore the Ten Commandments. And the Board of Supervisors soon after decided to support the decision, agreeing to help fund the district’s legal defense. “We would rather fight the ACLU or whoever would come up than have one anonymous coward who would not even sign the letter come in and tell us how to run our schools,” said Eric Gentry, chairman of the county’s Board of Supervisors. Public displays featuring the Ten Commandments have caused legal clashes for decades. The Supreme Court ruled in 1980 that a Kentucky policy requiring the commandments on the walls of public school classrooms violated the First Amendment. But in 2005, the court upheld the inclusion of the commandments as part of a monument that included 16 other historical documents on the Texas State Capitol grounds. Scholars say that the 1980 case, Stone v. Graham, will probably preclude the school board from legally displaying the commandments on school grounds. Although court decisions have underscored the line between church and state, many residents — who are quick to call Giles a “Christian county” — have expressed a desire to fight back against federal and state intrusions. Some of the county’s government buildings feature posters reading “In God We Trust” near their entrances. After the Supreme Court ruled that prayer in school was unconstitutional, the district introduced its weekly Bible Bus, which facilitates religious classes for most of the county’s elementary school students. That initiative is legal, according to local officials, because it’s voluntary, and the bus is privately owned and operated. In Giles, residents say the Ten Commandments display enjoys nearly universal support among those who grew up in the county. They say only outsiders, such as legal organizations in Richmond and Wisconsin, would question such a core aspect of the culture. Jochem was shocked when he first heard about the county’s Bible Bus, and bothered by the school board’s refusal to remove the commandments from public schools. Like several other community members, he supports the ACLU’s lawsuit. But with the current controversy spurred by an anonymous complaint, and a lawsuit expected to be introduced with two anonymous plaintiffs, Giles County residents say they have little reason to believe that there is much of a local fracture.